KANSAS CITY, MO --(eSolarEnergyNews)-- Burns & McDonnell met substantial completion requirements on March 1 for commercial operation of the Big Bend Solar project in Tampa, Fla. 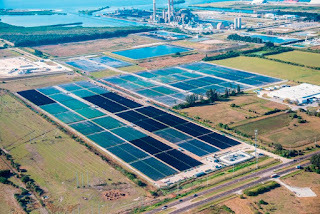 The 106-acre solar photovoltaic (PV) project is owned and operated by Tampa Electric and is the largest single source of solar power in the Tampa area with capacity to serve 3,300 homes. Situated near the Big Bend Power Station in Apollo Beach, it was the first utility-scale solar project undertaken by Tampa Electric. The plant feeds 23 megawatts (MW) of AC capacity into the Tampa area power grid. It features over 202,000 thin-film PV panels installed in 1,772 rows supported by 14,000 direct-driven steel piles. The panels are outfitted with sensors and drive motors that enable them to track the movement of the sun, resulting in a more than 20 percent energy gain over fixed solar installations. The Big Bend Solar Plant features inverters provided by SMA for conversion from DC to AC power and modules incorporating First Solar advanced thin film PV technology. "The Big Bend Solar Plant is significant in proving utility-scale PV is cost competitive with traditional generation for regulated utilities," says Matt Brinkman, Burns & McDonnell Principal and national director of solar projects for the firm. "Solar costs have decreased dramatically." Burns & McDonnell is a company of more than 5,500 engineers, architects, construction professionals, and environmental consultants with offices across the United States, Canada and throughout the world. Burns & McDonnell is ranked as the No. 1 Power engineering design firm by Engineering News-Record magazine and is ranked No. 14 overall among the Top 500 engineering design firms. We strive to create amazing success for our clients and amazing careers for our employee-owners. Burns & McDonnell is 100 percent employee-owned and is proud to be No. 16 on Fortune's 2016 list of 100 Best Companies to Work For. For more information, visit burnsmcd.com.